At the end of November 2016 reports appeared in Russian media about the deployment of K-300P Bastion-P system to Kaliningrad Oblast. If this information is confirmed, it will be yet another step taken in recent months which fits with the Russian strategy of deployment of measures within Anti-Access/Area Denial (A2AD) in key regions from the perspective of the security of NATO countries and operational capabilities of Allied Forces. Russia has been increasingly using the A2AD measures. The goal of this concept is to prevent an opponent from entering into theater (Anti-Access) by means of long-range weapons, and deprive him of freedom of action in this theater (Area-Denial) by means of shorter-range tools. To carry out A2/AD tasks the entire range of missiles is used including surface-to-air missiles (SAM), anti-ship ballistic missiles (ASBM), cruise missiles (anti-ship cruise missile, ASCM), mines or drones. Such measures are asymmetric, and are often used by potentially weaker countries, which use the advantage resulting from the operation in the vicinity of their territory. S-300 and S-400 systems – a family of anti-aircraft systems of ground-to-air class (S-300P and S-300V series) and water-to-air (S-300 Fort) produced by Almaz-Antey plants. Both S-300 and S-400 are mobile systems. The S-400 (S-300PMU3, NATO: SA-21 Growler) is the latest fully operational system within S-300 family (its development dates back to 1993). S-400 system is based on 5P85T2 launchers on vehicles (including self-propelled 5P85S2 and 5P85SM launchers and 5P90S, 5P90T and 51P6A), 96L6 target acquisition radar, 92N6 Grave Stone engagement radar and single-stage 9M96 and 9M94D interceptors (at the same time it may use the older 5V55 and 48N6 missiles family, including a new 48N63 version with a range greater than 200 km), with a range of 40 and 120 km respectively, and currently tested 40N6 missile with a range of 400 km with an active (also semi-active) radar homing. A full system has 72 missiles at its disposal and with the possibility of simultaneous missile guidance to 24 targets (some sources say 36), firing two missiles on each of them. According to the ‘Ten-year State Program of Armaments 2011-2020’ (Russian GPW 2020) approved in December 2010, by 2020 the S-400 system is to be incorporated in 28 regiments (by the end of 2015 the systems were put into use in 9 to 11 regiments, depending on sources). At the same time its successor is being developed – S-500 Triumfator-M (the plans assume 100 launchers by 2020). Moreover, the Russians maintain more than 30 regiments equipped with older S-300PS systems (NATO: SA-10 Grumble) and S-300PM (NATO: SA-20 Gargoyle). Bastion systems – K-300P Bastion-P (NATO: SS-C-5 Stooge), which was incorporated to the Russian Armed Forces in 2010, is a mobile coastal defense system produced by NPO Mashinostroenia. Its main task is to combat surface ships, including aircraft carriers approaching the coast. The battery consists of 1-2 command and control vehicles, 1 support, 4 loader vehicles and 4 launchers (each with 3 man crew) with 2 missiles on each. Launcher vehicles can be located at a distance of 25 km from command vehicle, and upon halting the system can be ready for use within approximately 5 minutes. The system is equipped with supersonic missiles P-800 Oniks / Jachont (NATO: SS-N-26 Strobile) with a 200-250 kg warhead moving at a speed of 2.5 Mach. Depending on the altitude, the missile range varies from 120 to 300 km. Importantly, the system also has the ability to destroy land targets. Submarines are important elements that could prevent NATO forces operations in key basins. Russia systematically introduces new conventional submarines to the service. The Russian GPW 2020 is to provide the Black Sea Fleet with 6 conventional submarines – Project 636-M/636.3 Varshavyanka (NATO: Improved Kilo). The last one was delivered to the Russian Navy in November 2016. These ships have a capacity for destruction of land targets with Kalibr cruise missiles with a range of approximately 1500 km. The development of submarine forces and systems of coastal defense is a continuation of the strategy of ‘maritime bastion’ of the Cold War, i.e. the creation of strongly defended marine sites in the country’s coastal areas (with mines, coastal missile systems and carefully patrolled by fleets and submarines) to protect the fleet of strategic submarines. Means of electronic warfare – the ability of the Russian A2AD also depends on the means of electronic warfare (WRE). Especially dangerous here are 1RŁ257 Krasucha-4 systems, which give the possibility of jamming radar signals (it can intercept and interfere with the signals emitted by reconnaissance satellite, early warning aircraft, drones and ground stations) and have a range of 150 to 300 kilometers. The system is likely to complement mobile stations – 1Ł269 Krasucha-2. The Krasucha system undergone trials in 2011, and a year later it was put into use. Among other Russian WRE systems there are 1L267 Moscow-1 and Borisoglebsk -2. The efficiency of the Russian system is also determined by the doctrine and speed of decision-making processes. In this regard, Russia has the advantage due to the so-called escalation dominance, or ease of the rapid and efficient escalation of the conflict. In response to the shooting down by Turkey on 24 November 2015 of a Russian bomber Su-24M, the Kremlin decided to shift a set of its latest defense system, S-400 Triumf, to the Hmeymim air base near the port city of Latakia in Syria (located approximately 50 km from the borders of Turkey). Russia also moved to the coast of Syria its missile cruiser Moskva, armed with Fort antiaircraft systems (marine equivalent of the S-300). In addition, the Russian contingent, amounting to 31 combat aircraft (11 Su-24m2, 12 Su-25SM, 4 Su-30SM and four Su-34) and 10 combat helicopters (Mi-24/Mi-35), was reinforced by additional fighter-bombers (4 Su-34) and multirole fighter jets (Su-35S 4). On March 14, 2016 President Putin announced the withdrawal from Syria of a substantial part of the Russian contingent (including approximately 60 airplanes and helicopters). Russia also announced that it would maintain the Tartus and Hmeymim bases, and more importantly, the S-400 would remain in Syria. This confirms suspicions that Russia’s actions in this country are not a direct response to the growing tension in the region, but also part of a broader strategy aimed at limiting the freedom of action of NATO countries in strategic regions. The S-400, located in Latakia base, has within its reach not only a large part of Syria, but also Turkey’s strategically important Incirlik base, which conducts operations against the so-called Islamic state (U.S. B-61 nuclear bombs are located there within NATO nuclear sharing). 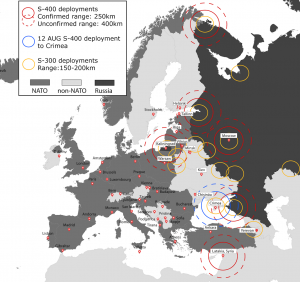 For Kremlin, Russia’s deteriorating relations with the countries of NATO and the European Union justifies the expansion of military capabilities in the region of Kaliningrad. In the region, located between Poland and Lithuania, the 336th Guards Marine Brigade under Baltic Fleet Command is currently deployed as well as the 79th Guards Motorized Rifle Brigade under the Western Military District and the 7th Guards Motor Rifle Regiment (Kaliningrad). A strong air component is also under the jurisdiction of the Baltic Fleet. The main units here are the 689th Independent Fighter Aviation Regiment (base in Chkalovsk, with Su-27) and the 4th Independent Naval Assault Aviation Regiment (Chernyakovsk Air Base with Su-24). The 152nd Guards Missile Brigade, at Chernyakovsk Air Base, has a high offensive potential in the Kaliningrad region. It is equipped with Tochka-U missile systems (range up to 120 km) and Tochka-M (185 km). In the two squadrons there are three batteries in each (12 launchers in total – each battery has two launchers). In Kaliningrad the 244th Artillery Brigade is also stationed with 2A36 Hyacinth B-caliber 152 mm with a range of up to 33 km and BM-21 launchers. From the point of view of A2AD capabilities, a major role is played by the 3rd Aerospace Defense Brigade in Kaliningrad. Two air defense regiments, equipped with S-300, are subject to the command of the brigade: the 183th from Gvardeysk and the 1545th from Znamiensk. In the first one there is one squadron of S-400 Triumf (the system’s range covers a large part of Poland, Lithuania and Baltic Sea, which could significantly hamper NATO aviation operations in the event of a conflict with Russia). The 22nd Independent Air Defense Regiment in Kaliningrad is, in turn, equipped with Tor-M1 systems. From the point of view of NATO operation early-warning radar Voronezh-M is also significant. It could detect objects at a distance of up to 6,000 km. In Baltijsk the 25th Coastal Air Defense Regiment is deployed (with three batteries of mobile missile sets of class water-water P-35 Redut, each is composed of three starting sets with vehicles with supersonic anti-aircraft missile P-35 with a range of about 250 km). On the other hand, the deployment of the Bastion would provide the 25th Regiment with the ability to combat land targets. After the occupation of the Crimea and the illegal referendum in March 2014 where Russia annexed it to its territory, Russian forces have systematically deployed armaments to the peninsula. It has a strategic importance for Russia: in the event of a conflict, the distribution of the missile systems may block a large part of the Black Sea, preventing NATO forces operations. Russia quickly started to reorganize the units in the Crimea. The 128th Coastal Defense Brigade (based on the Ukrainian 36th Separate Coastal Defense Brigade in Pieriewalne in Crimea), was formed as well as the 501st Battalion of Marines in Theodosia (based on the Ukrainian 1st and 510th Marines Battalion) and the 10th Brigade of Naval Aviation of Ukraine in Saki was reformed into the 19th Brigade of Naval aviation of the Russian Black Sea Fleet. In Crimea the following units were established: the 12th (Sevastopol) and 18th (central part of Crimea) and the anti-missile regiment as well as two air regiments: the 37th (mixed) and 38th (fighter) were deployed. Within a few months 40 new military units appeared on the peninsula. 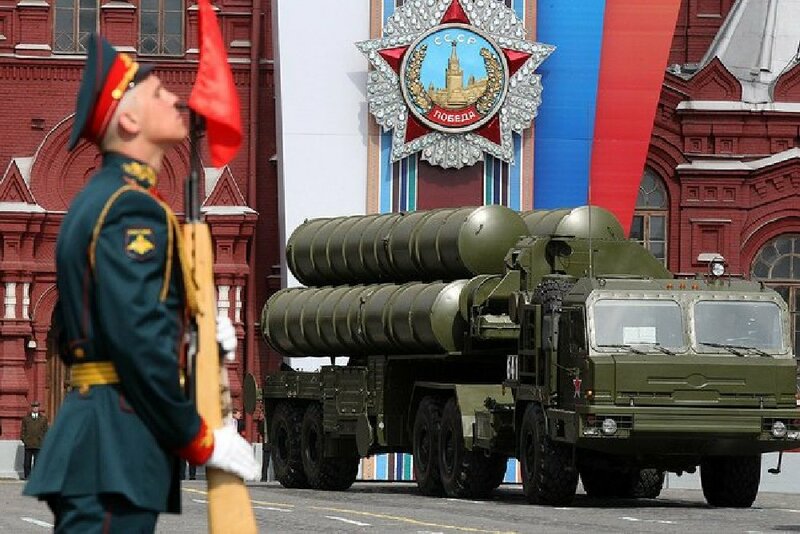 Importantly, in the Crimea a series of A2AD systems have been installed, such as S-300PM, S-400 Triumf and Pancyr missile systems as well as Iskander. The K-300P Bastion-P has been significantly developed to increase coastal defense. Russia has also developed its forces in the Arctic region. From the point of view of Moscow, this region is also of strategic importance for the country, when taking into consideration, for example, its great natural resources. Thus, two Arctic motorized rifle brigades were formed in Peczendze (the 200th) and Allakurtti (the 80th), and in 2014 Joint Strategic Command ‘North’ was created. In the region of the Kola Peninsula and the Barents Sea, the Pancyr systems and S-400 systems were deployed and airfields were prepared for fighter aircraft. The Russian Federation, taking into account the military superiority of NATO, has been developing asymmetric means of A2AD. The most important of these include S-300/S-400 and Bastion systems. Consistent deployment of such measures in various regions (the Baltic Sea region, the Crimea, the Arctic, Syria) is part of a broader Russian strategy to prevent NATO forces operations in the NATO border states and in the regions perceived by Moscow as their strategic ones. NATO countries should develop a common strategy and invest in resources and weapons systems that could break A2AD systems i.e. standoff weapons (mainly cruise missiles on air and sea platforms, supported by an effective system of real time targeting). An interesting solution may be the air forces of NATO countries acquiring a large number of small and relatively cheap unmanned ships, which could pretend combat aircraft (miniature air-launched decoy, MALD) to misguide and neutralize anti-missile systems. In this context, NATO needs to consider developing capabilities in fighting against A2AD in its defense planning (NDPP – NATO Defense Planning Process). The issue of intelligence and reconnaissance (ISR) is also crucial from the point of view of NATO countries because the appropriate tools in this regard would allow the identification of the enemy’s means and intentions. The possibility of blocked access to a large part of the Baltic Sea and the Black Sea should also be included in the so-called Readiness Action Plan of the Alliance. It should be borne in mind that A2AD systems may block the ability to quickly shift immediate reaction (VJTF) force and the NATO Response Force (NRF), therefore more focus should be placed on development of the forces that are already present in the potential theater of operations (Enhanced Forward Presence) and ensuring the rapid destruction of A2AD, regaining and maintaining air superiority. However, to ensure the possibility of immediate reaction it is necessary to improve decision-making within NATO, so that VJTF could be deployed in the region of crisis before its eruption. Poland should continue to introduce AG-158 JASSM missiles and continue efforts to obtain its versions of extended range (AGM-158B JASSM-ER). Necessary in this area seems to be the creation of an imagery intelligence system and determining the coordinates of targets (targeting) and determining their priority. To fully take advantage of these missiles it is necessary to introduce to Polish aviation additional combat aircraft (supported by C3ISR systems and air-tankers). From Poland’s point of view, it is also essential to swiftly accomplish the process of obtaining missile modules (Homar program) and Regina artillery modules.